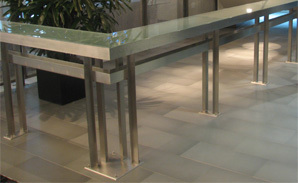 Alumafloor can be designed and manufactured in any shape or dimension a client desires. 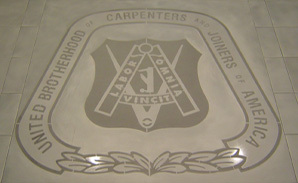 It can also be cut to suit any architectural need and meet any design challenge. Precision machining, allows for tight-fitting panels which need absolutely no grouting. Aluminum panels are then adhesively affixed to a suitable substrate, eliminating the need for fasteners and resulting in a smooth, monolithic, high-tech appearance. 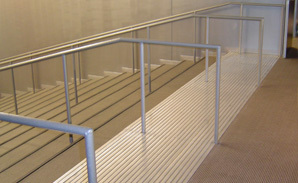 Aluminum wall base, stair treads / risers and tactile products are also available. 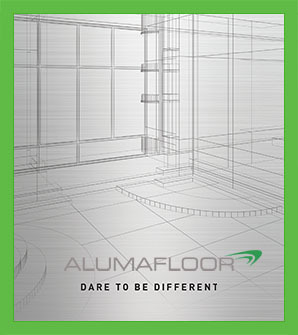 Alumafloor reflects a style born of a unique need and comprises an equally unique set of strengths and beauty. Alumafloor is well suited to commercial traffic areas and is fabricated to meet ASTM C 1028, the standard test developed to measure the friction of ceramic tile and similar surfaces. 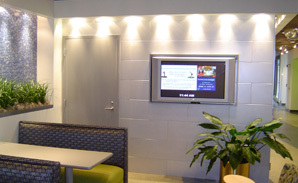 Give us a call and we will work with you to make a product to suit your needs. 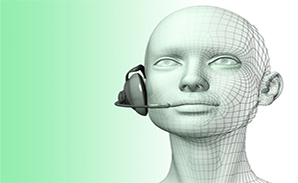 Our telephone number is (630) 628-0226.